“John is a huge asset to UVM...exceptional, approachable, fair and challenging...students enjoy his teaching.” — Associate Dean Patricia Corcoran, Director of UVM's Student Affairs Division. The above words were taken from a letter written by Dean Corcoran in support of my reappointment as lecturer in the University of Vermont's Department of Economics, where I successfully taught more than 75 courses, including two Honors College seminars, to over 2,500 students between September, 2009 and May, 2017. I began my teaching career in 1989 in Connecticut, where I was raised. But the Chair of my department and some faculty reviewers, using exaggerated and false claims, convinced the Dean to deny my reappointment during a review in late 2016. 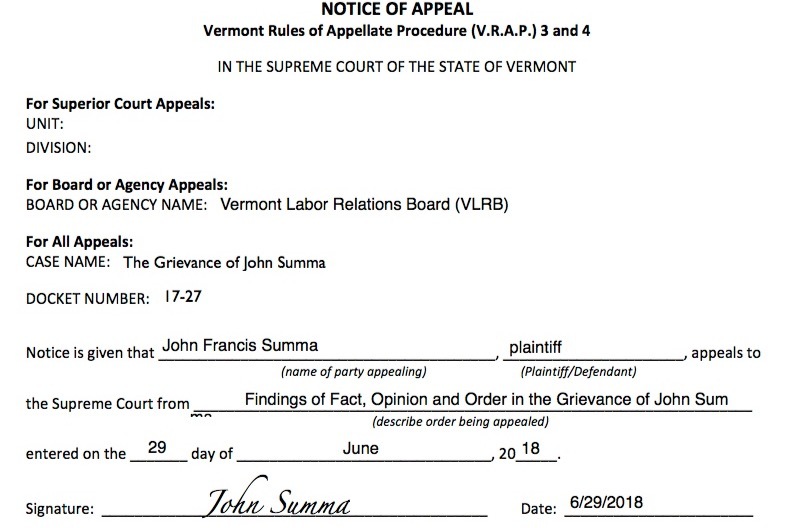 Despite proving there was no factual basis for the key claims against me, my grievance before the Vermont Labor Relations Board (VLRB) was dismissed earlier this year following a two-day hearing in February. Now I'm taking the next step required to seek justice -- I'm appealing the VLRB's decision to Vermont's Supreme Court. But I need your help. 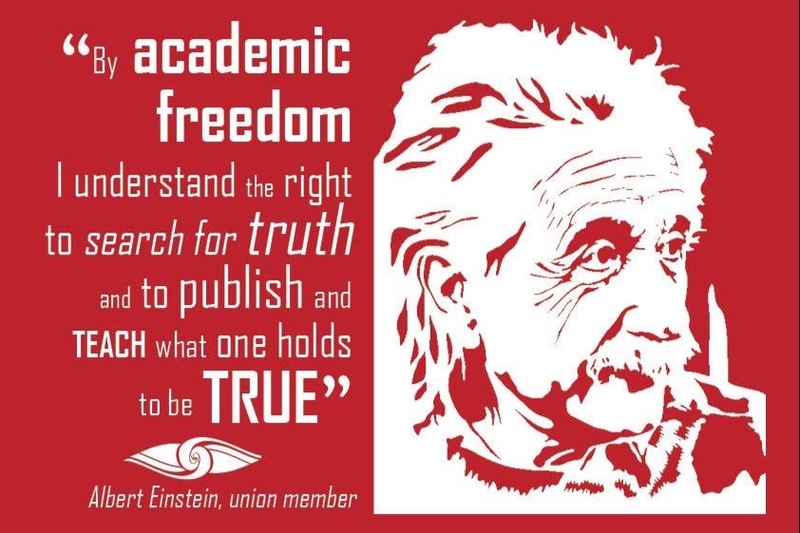 This is an important and necessary fight for our academic freedom. As Associate Dean Corcoran wrote in her letter, I am well known as being a "challenging" lecturer. 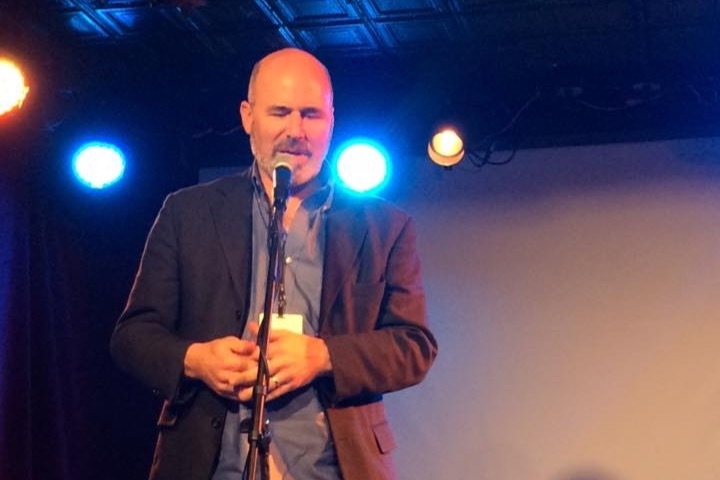 To kick out a challenging, popular and veteran teacher, one who has top student evaluations, would seem to fly in the face of UVM's own values. Students have the right to hear all points of view. In spite of this, UVM's Provost permitted a complete lack of accountability regarding the behavior of certain faculty, the Chair and the Dean of the College of Arts & Sciences. As I demonstrated to the VLRB, exaggerated and false claims by peers and the Chair were sent to the Dean, who relied on these statements to deny my reappointment. This violated my procedural right to a fair review. But the VLRB never addressed this evidence I provided to them. It was ignored in their written decision dismissing my grievance, which amounts to a denial of due process. My teaching threatened a number of powerful faculty in my department because it inspired many students to question conventional models that fail to address major public concerns -- like global warming, growing inequality and systemic market failure. Many of the faculty are professionally attached to these models - or do not care to fully and fairly educate students about the profound shortcomings of the standard economics curriculum and present the many alternatives . I have strived to be a challenging, interdisciplinary, unorthodox teacher and have always been embraced for it. My primary goal as an educator is to empower students to think for themselves by exposing them to a variety of economic viewpoints. UVM's Department of Economics Chair took the lead in what UVM's highly respected Faculty Standards Committee(FSC) believes was a determined effort to remove me from the department, which was revealed by a whistleblower on the committee (entered into evidence at the VLRB). In spite of the FSC's unanimous vote for my reappointment, UVM's Dean William Falls, who is professionally close to the Department of Economics Chair through work on some of his special committees, sided with her -- and my fate was sealed. "One of the few heterodox lecturers in the economics department, very popular with the students, was recently purged. He used the Freedom of Information Act to access the emails discussing his firing, and it is quite obvious that his crime was to challenge the economic orthodoxy, as he has chronicled in his blog. Economics departments appear to be advocates of competition everywhere except in ideas." In the letter cited above, Associate Dean Corcoran also noted the following: "We are often the first folks to hear when a course is going poorly or when an instructor is perceived as weak. Conversely we are also quite likely to hear when an instructor is exceptional - and that is the case with John." This was too much for the Chair, as it stood in the way of painting me as a "poor" teacher. I proved in front of the VLRB panel that she sought to purge Dean Corcoran's letter so that my colleagues and other faculty would never see it. The Chair wrote in an email to Dean Falls, which I obtained through a public records request, that having the Corcoran letter in my dossier would be "awkward" for the department, mainly her, if the vote went against me. Since she had already written three extremely negative peer reviews, the Chair knew a letter from the highly respected Dean Corcoran would contradict her false characterizations of my teaching. 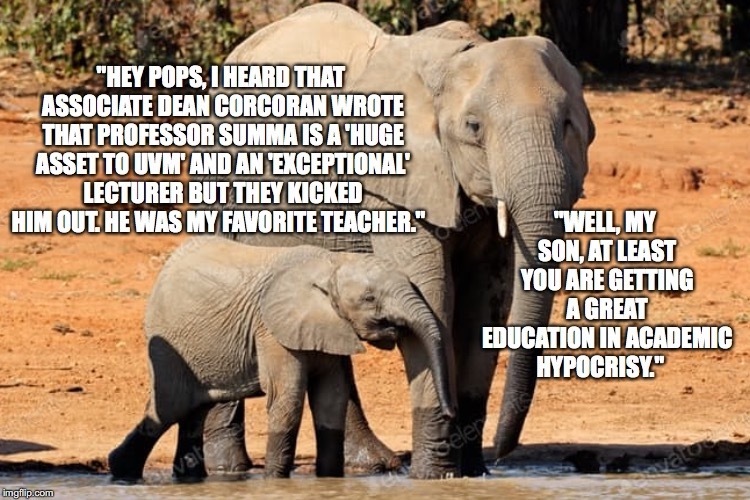 Dean Corcoran is "very competent" and "honest" as the Provost admitted under oath during my examination of him. And Dean Falls admitted during examination that she has interacted with thousands of students, including many from economics, so she knows the score. "I took a number of insightful, thought-provoking classes from Professor Summa during my time at UVM. I not only enjoyed them, but also left each one energized and enthused to continue learning, ask questions and demand answers." "John Summa was an excellent professor, mentor and friend to me. His lectures we’re always intellectually challenging, and he was willing to go the extra mile for students who wanted to learn more." "John Summa is one of my favorite professors. he is an amazing teacher, very patient, and very helpful." "I came to UVM with the hope that I would experience a diverse learning community where my preconceived notions and ideas could be challenged. Professor Summa encouraged me to question accepted economic theories, think beyond what I had previously learned, and helped create a classroom environment where no idea would be laughed away as being ‘too radical’. Silencing this kind of creative thought and preventing the spread of new ideas is not only against what I believe but seems to contradict the values shared by the University of Vermont. Professor Summa should have his contract renewed so others may be exposed to a learning environment where new and challenging ideas exist." "This man is a phenomenal teacher and kept EVERYONE interested every class period. This is honestly a disgrace. Shame on you UVM." With top student ratings, the Chair had to resort to false claims about my teaching to persuade faculty to vote against me -- and to convince Dean Falls to go along with the purge. It worked, so far. 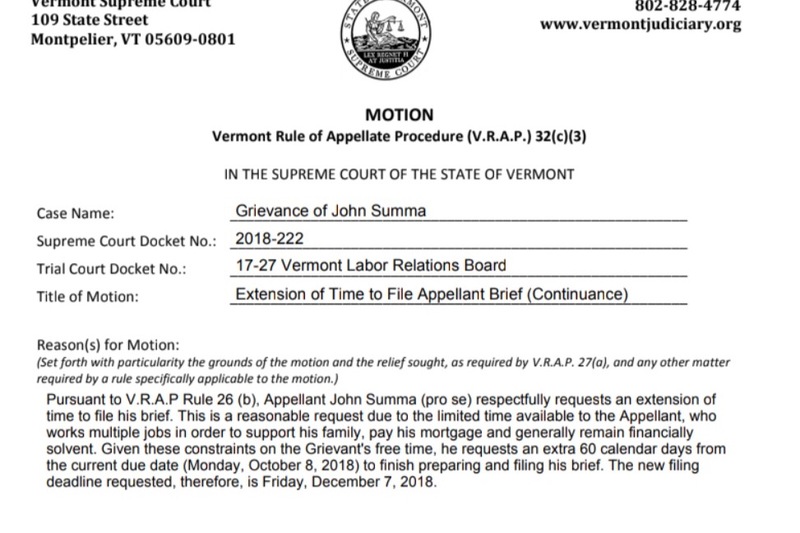 But we can still bring about a just outcome if I can bring the facts to the Justices of the Vermont Supreme Court and let them apply the arguments to these facts -- arguments and facts the Vermont Labor Relations Board refused to engage and evaluate despite having them in their possession. I need your help to cover legal costs - including attorney and filing fees, Labor Board transcript costs, and copying costs. Actually, $4,500 is a small price to pay for defending academic freedom and for standing up to bullies who must be told "you cannot do this to exceptional teachers from whom students have the right to learn". Short update (with more to follow soon): I just filed my Appellant Request to Make Oral Argument at the Vermont Supreme Court. This is the last step in the process of setting up my appeal for wrongful denial of reappointment as an economics lecturer at UVM. Meanwhile, here is my latest post at deadendeconomics.com, including a cartoon I made to capture the gist of the post. UVM lawyers read these updates, by the way, and even unsuccessfully tried to stop an earlier motion of mine by attempting to smear me using one of my previous updates (with defective inference). It's nothing new with their behavior. My post has lots of background related to "invisible foot" economics and other content that "pushed the buttons" of my "colleagues" inside the increasingly conventional Department of Economics at UVM - a department that once described itself as heterodox (about 10 years ago -- I have the official document). Now it is dominated by anti-heterodox economists, neoliberals, and neoclassicals without a clue about alternative traditions. Oh, and there is one left-over (opportunistic) lefty economist. All tenured and protected, of course, unlike the only lecturer in the department, yours truly. Meanwhile, here is my latest post at deadendeconomics.com, including a cartoon I made to capture the gist of the post. UVM lawyers read these updates, by the way, an unsuccessfully tried to stop an earlier motion of mine by attempting to smear me with a false claim. It's nothing new with their behavior. My post has lots of background related to "invisible foot" economics and other content that "pushed the buttons" of my "colleagues" inside the increasingly conventional Department of Economics at UVM, a department once described itself as a heterodox department (about 10 years ago -- I have the official document) to one now dominated by anti-heterodox economists, neoliberals, and neoclassicals without a clue about alternative traditions. Oh, and there is one left-over (opportunistic) lefty economist. All tenured and protected, unlike the only lecturer in the department, yours truly. Below are some extracts from a UVM administration official (who clearly sees through subterfuge). I will not reveal the person's name or exact title in order to protect the official from retaliation from UVM. Suffice it to say, this official is at a high-level at UVM, and has reviewed the factual record about my case. "It is clear they [Dept. of Economics] scrutinized and targeted you because you pushed their buttons. My experience with UVM faculty is that they can be pretty vindictive with anyone who dares to question the status quo. It is very disappointing. I really hope that your appeal gets a fair hearing." In reference to arbitrary and capricious UVM reviews of faculty, this person continues with more comments. "I know of at least one case in a different department where a faculty [member] with poor student teaching evaluations and under-par peer evaluations was unanimously reappointed." To be clear, my student evaluations were good to excellent from over 2500 students and my peer reviews were a mix of perspectives, good ones contradicting bad ones, but the chair wrote three that were outlier negative letters riddled with now proven falsehoods, distortions and can't-pass-the-smell-test statements that appear idiotic when read by any reasonable person. Too bad the Labor Board found "no evidence" of such behavior. As I argue, they had the evidence but chose to ignore it, which is one part of my appeal. Meanwhile, I will do one more public records request for the reappointment decision documents (dean's evaluation statements) of the past three years, or since Dean Falls (who denied my reappointment, taking the chair's side) came on board. Let's see what hypocrisy we can find, or in legal terms arbitrary and capricious decision making by Dean Falls, who wrongfully denied my reappointment and took the Chair's side (who he is involved with on a number of his special committees). It will make for excellent content to contrast with misleading statements under oath by the Provost and Dean -- statements at the Labor Board hearing, that is (was were filmed in HD with two cameras by a professional videographer hired by me and fought over in a motion by UVM to ban cameras at a public hearing -- needless to say they lost). I will start editing together a film doc about my ordeal shortly after the Supreme Court appeal is done.